Have you ever seen the “Who Rescued Who?” bumper sticker? It begs a good question. The healing power that animals provide is underestimated. There are many people who talk about their rescued animals, but not many talk about how their animal friends have rescued them. Animals have secret super powers—the ability to heal broken humans. People talk to their furry friends and tell them their worries and their secrets, knowing that they’ll keep them safe. They don’t realize that by rescuing these animals they’re not just helping the animal, they’re also helping themselves. These animals fill a void in people’s lives by giving them something to take care of and focus on other than themselves. Humans provide forever homes for animals and animals provide unconditional love for humans. Although all pets can provide an emotional connection with their human, according to the American Kennel Club (AKC), Emotional Support Animals (ESAs) are animals that are prescribed by a licensed mental health professional, such as a therapist or a psychologist. They believe that these animals can provide specific emotional support to help them deal with their feelings. An Emotional Support Animal offers therapeutic assistance to their human through support and companionship in order to repair symptoms caused by mental or emotional impairment. Since Emotional Support Animals are known to ease mental disorders like anxiety, depression, phobias, and PTSD, they are prescribed by mental health professionals to help with these conditions. ESAs are different than service dogs. The AKC states that service dogs are trained to perform certain tasks for people who are physically disabled. Psychiatric Service Dogs are dogs who are trained to do certain tasks that help aid with mental illness. For example, if someone is prescribed a Psychiatric Service Dog, it might help remind them to take medication or keep a disoriented person from accidentally walking into traffic. These animals play a critical role in many individual’s lives by significantly improving their quality of life and emotional health. Suwanee Town Center hosted the 4th annualJonny and Xena “Spread of Words” 5k Run/Walk/Fun Run festival on Saturday October 27th for free pet adoptions. All the proceeds went to support for Autism programs and Animal rescues.The festival allowed different non-profit organizations to display their rescues so that people could have the opportunity to adopt or foster them. Many organizations have beautiful heartfelt stories that mark the beginning of their success in saving animals in need. Among these organizations, Caitlin’s Vine of Bravery had a particular story that stands out. Caitlin had a booth set up displaying some merchandise and fliers along with three dogs that were up for adoption. 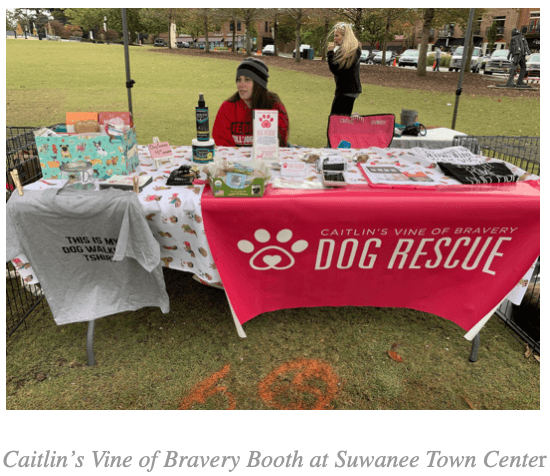 Last year, Caitlin’s Vine of Bravery participated in another annual festival hosted by another large rescue organization, Rescue Dog Olympics. This festival’s purpose is to bring together the organizations that rescue and foster dogs that are in need of safe homes. In order to raise awareness and give these dogs a voice, they educate people on how they can help save dogs’ lives and offer opportunities to adopt dogs. 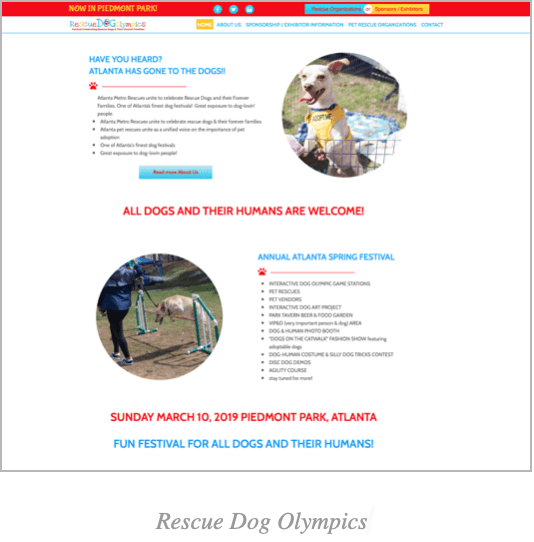 This year, the Rescue Dog Olympics festival is in Piedmont Park on March 10th 2019. As it does every year, the festival will celebrate rescue dogs and their forever families with events like dog Olympic game stations, a dog and human photo booth and disc dog demos, and many other fun events tailored for dogs and their humans. Organizations like Caitlin’s Vine of Bravery and Rescue Dog Olympics work hard to give these animals a voice. They bring awareness to the problem that there are a lot neglected animals in need of forever homes. They advocate for them and they treat them with the kindness they deserve, setting an example for the public. By giving others an opportunity to take in and foster rescued animals, they are giving animals safe homes to thrive. Non-profits encourage people to get involved in the rescuing and fostering animals in need. 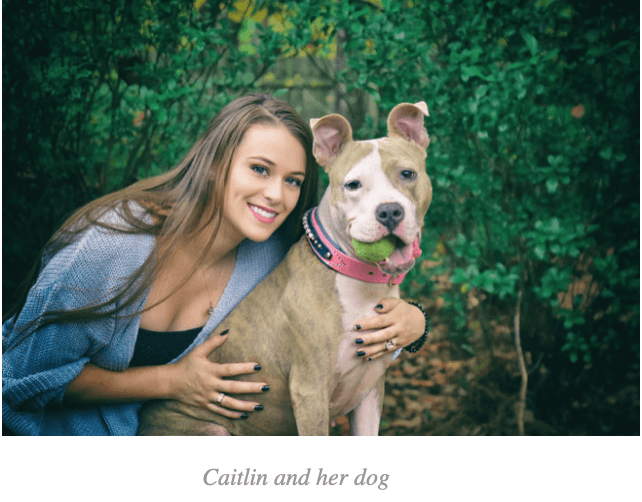 Caitlin’s Vine of Bravery has a fostering program in place for those who want to take part in saving the lives of dogs in need.